With E3 season over, it’s time to get back on One Piece. A lot of big revelations here! Okay okay okay okay. Why is nobody talking about that swirly thing on the second wanted poster that we can barely see? All the wanted posters have two swirly things on each side of the poster, one of them facing inside and the other facing outside. But this one has both swirly things facing inside. 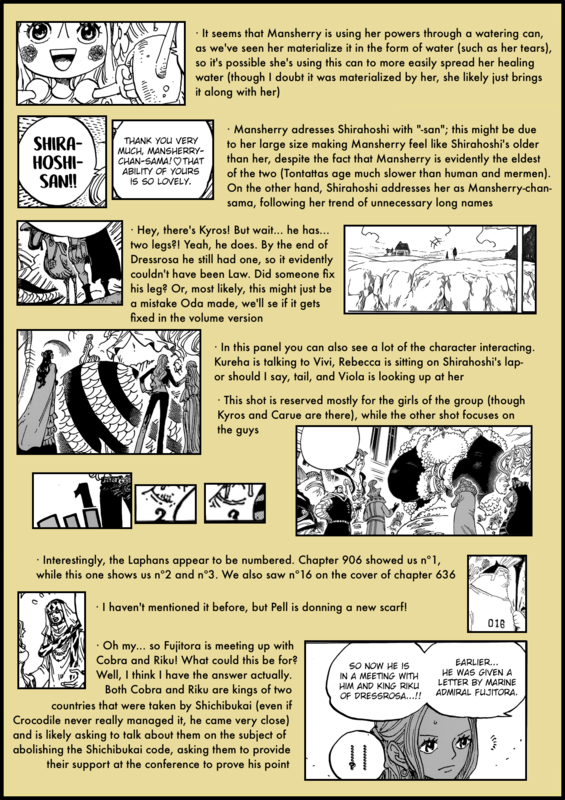 It could just be a mistake by Oda, but I somehow doubt that he would mess up a scene as important as that. Now I think that this could either be a typo by the marines, making that wanted poster unique and one of a kind, which would make it really easy to distinguish (as of now we have not seen any wanted posters with swirly things that both face inside, I checked), meaning that when Blackbeard’s wanted poster is revealed we will be able to instantly tell, whether or not it was his poster that the king dude was holding. Or it could also be the old way the marines used to make wanted posters, like the way wanted posters looked back in the day, before they changed the design to what it is now. Meaning that that wanted poster is really old. 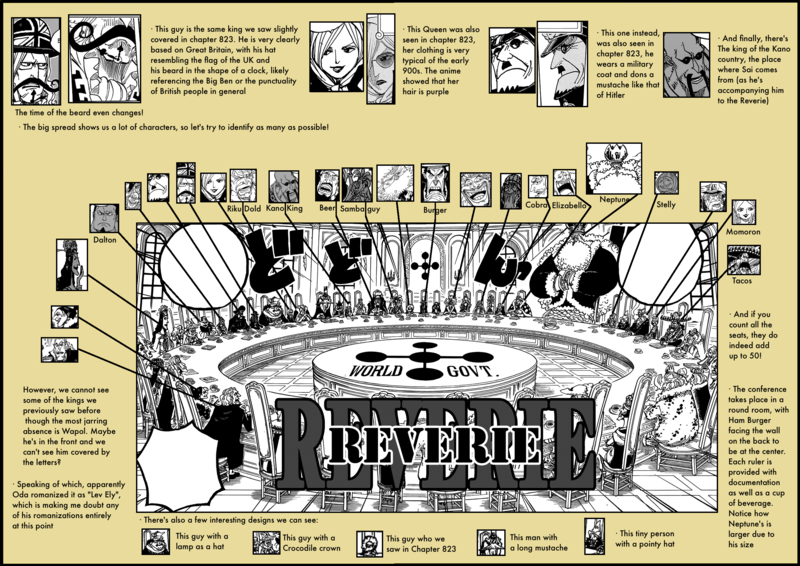 Or or, Oda just hasn’t mastered the art of drawing swirly things. is the sword that pierced shirahoshi picture is gryphon ? I count only 49 kings at the table. And look at what they drink. The chinese guy is the only with a mug instead of a cup of coffee, tha lady with the headscarf and the guy that is smoking are the only with nothing to drink. Oh my god you’re right! The kano country’s king is drinking with an eastern tea cup instead of the coffee cup! I believe it’s Jerma 66 that absent from the reverie for Totland Arc. It seems possible that Im is a Nefertari, based on the past couple chapters. 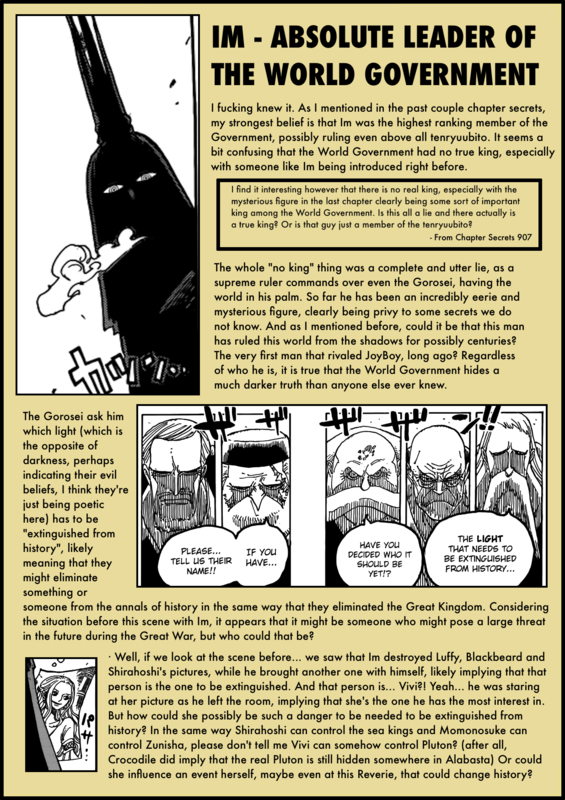 Last chapter we were shown, through Don Quixote, that just because some family members left, doesn’t mean they all did, and being secret king could make Im separate from the “original 20.” It also gives reason for Vivi’s picture to be undamaged. If so, and especially if Vivi is Pluton, the history Im might want to erase is the Nefertari’s stepping down as tenryuubito. Perhaps the meeting with Cobra is really about inviting him to stay. Or killing him and capturing Vivi. I think I’ve thought of a more likely theory. Also correction to “Vivi is Pluton” of course being “Vivi can control Pluton” in my previous comment. Rather than being related, I think it’s more likely Im wants to marry Vivi. If Im is immortal from the Ope Ope fruit, it might even be something like he was in love with her ancestor 800 years ago who Vivi resembles. In which case, I find it more likely that he will want to kill Cobra. 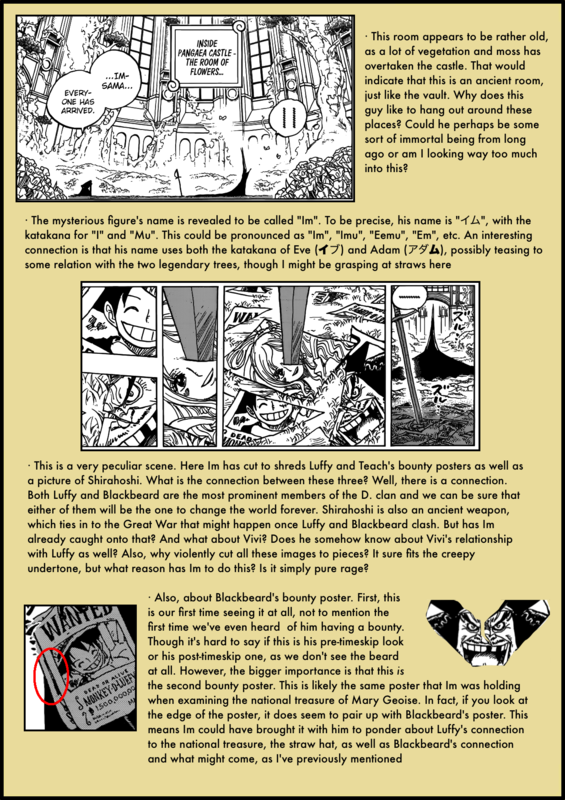 What if… “Im” or.. “I´m” is something a little “4thwallish” and is based on oda? 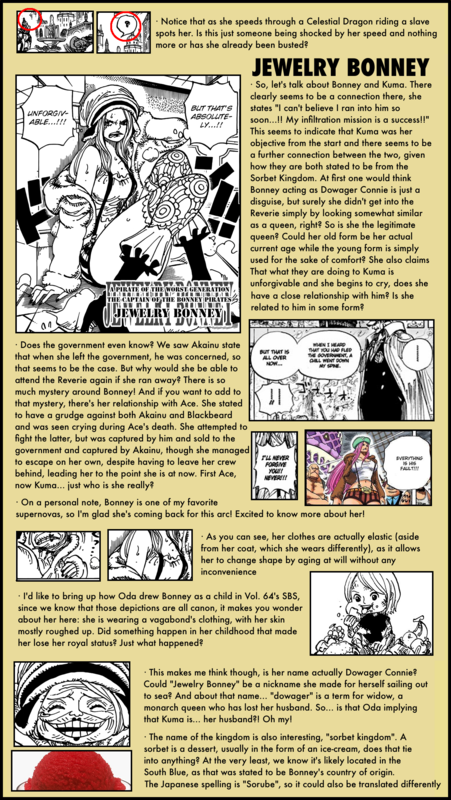 Did we get confirmation that Bonney has a connection with Ace? From what I remember she never specified, so it could be possible she has a connection with either Ace or Whitebeard. For some reason I always thought she was talking about WB but I guess Ace is just as likely. The character of the word “Imu”, I think it resembles the word “仏” (Hotoke), means Buddha. Or, it can be read in Kanji, as 仏 (Futsu) means Buddha, the dead, or as abbreviation of France. Nice Review Artur.. I like how you breakdown all the story and important parts of the chapter. I’m wondering that Dr Vegapunk is not evil. 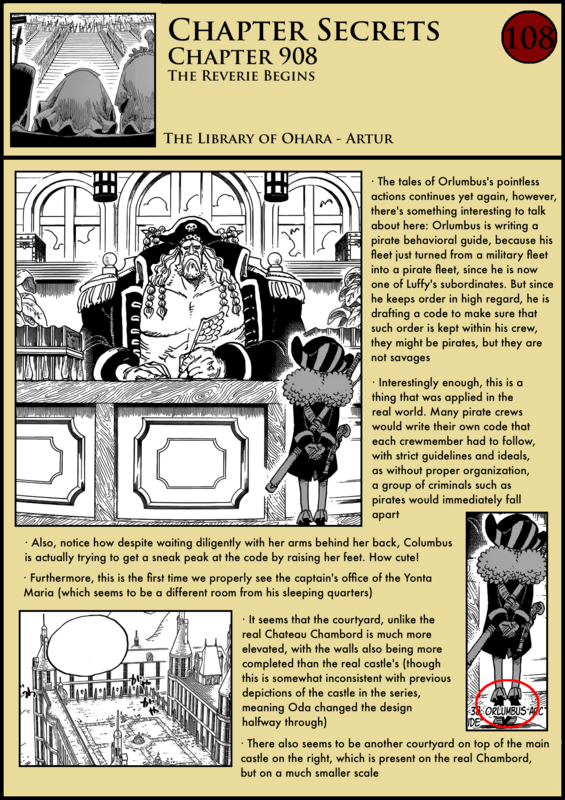 First, Oda potraited other characthers as evil in first mention, like Jimbei, Zoro and others, so it wouldn’t be something new. He was also shown as a good person in Frank timeskip story. And also cut ties with Caesar due to his evil experiments. 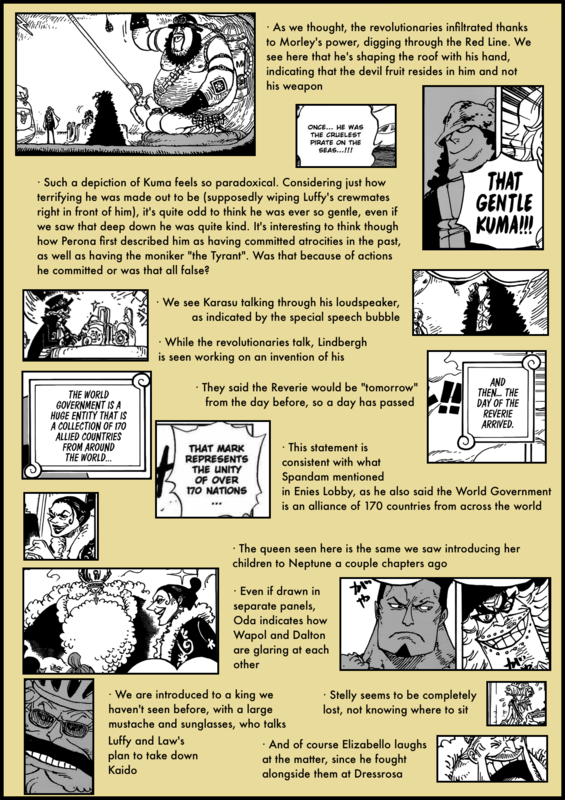 For what is showed in this chapter and the story in general, Kuma was a King that, for some reason, joined the revolutionay army (probabbly some injustice commited by tha World Gocernment). As he was a king, he was taken as an example for other kings to not betray the World Governmen. However, it seems Vegapunk allowed him to carry his will for sometime. He probably argued that he nedded Kuma for the Pacifista project, but the liberty Kuma had, especially when he was programed to protect the Sunny, is something that makes me think there is something to it. 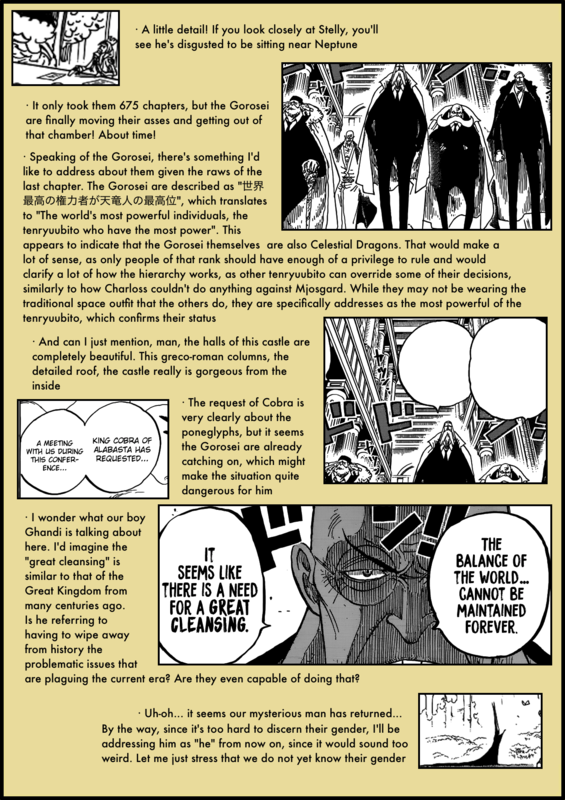 Another possibility is that he made something for the revolutionary army, made some kind of agreement, or to protect them or to promote some objective they had, but it doesn’t make much sense, for the WG wouldn’t allow that (and the revolutionary talk in this chapter point to the other direction). So I think it is really possible that Vegapunk isn’t evil. 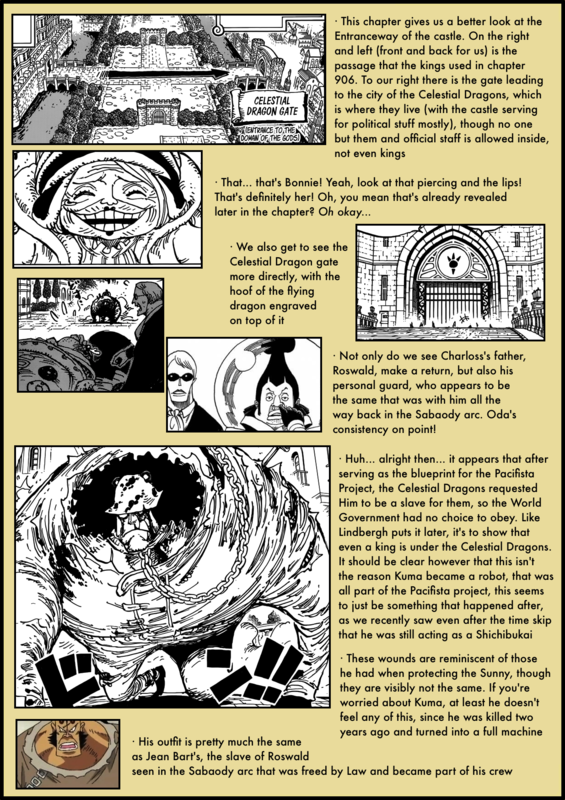 Probabbly a guy with his own objectives and that, maybe, can enter in the way of the Strawhats, but not a government minion, as Oda wants us to think. 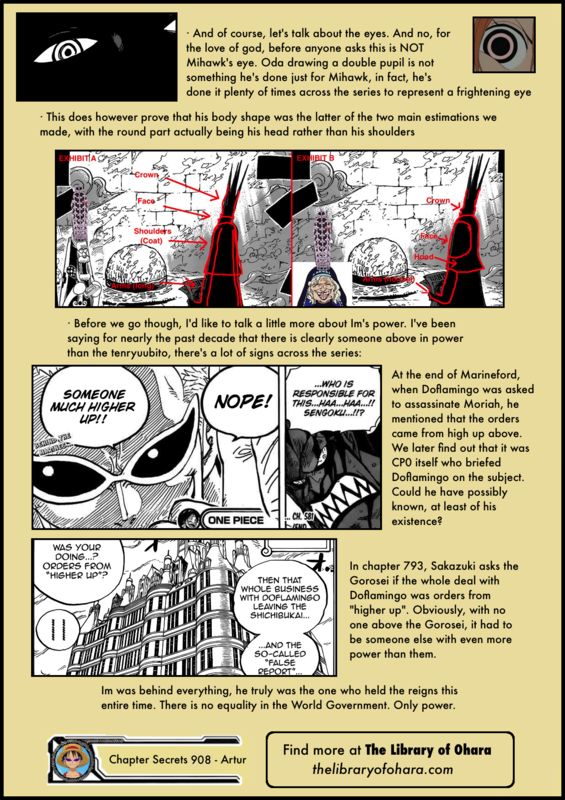 I don’t read a lot of theories, just comments on chapters and your site, so, sorry if this isn’t something new. Ah I see, thanks. I get it so that’s what they mean by “remain on the surface” rather than “going up to mary joise”. One more question: have you ever mention or analyse who are the founding 20 members? Hi Artur, amazing work as usual. One minor point, for somebody who creates such profound content it pains me to see you spell of one of 20th century’s greatest leader’s name incorrectly. Its “Gandhi” and not “Ghandi”. Sincerely hope this is corrected in the future. Thanks again for the amazing work though! I’m sure it was just a typo so pointed it out. I mean, his influence and success in liberating them from British rule is definitely respectable, and he deserves aknowledgement for that, but he wasn’t some perfect figure, he wouldn’t even look at or help the lower caste there, and the caste system in India is one of the worst human rights violations in the world. To spit on and treat humans like that for being born into a certain caste is like the trash city in the kingdom in Goa, but real life. He also cuddled with underage girls to test his will, and was insanely racist towards blacks in his younger days. I only count 49 seats. Did I count it wrong? Amazing job. And what about the person that tells Im that the Gorousei have arrived? It wasn’t one of them, so maybe in Mary Geoise and even in the Marines there are some people here and there who serve direct to him/her.